Baseball Prospectus | Baseball ProGUESTus: The Scott Boras Factor: Reality or Hype? The Scott Boras Factor: Reality or Hype? Believe it or not, most of our writers didn't enter the world sporting an @baseballprospectus.com address; with a few exceptions, they started out somewhere else. In an effort to up your reading pleasure while tipping our caps to some of the most illuminating work being done elsewhere on the internet, we'll be yielding the stage once a week to the best and brightest baseball writers, researchers and thinkers from outside of the BP umbrella. If you'd like to nominate a guest contributor (including yourself), please drop us a line. Vince Gennaro is the author of Diamond Dollars: The Economics of Winning in Baseball and a consultant to MLB teams. He teaches in the Graduate Sports Management programs at Columbia University and Manhattanville College. He is also on the Advisory Board of The Perfect Game Foundation and the Board of Directors of the Society for American Baseball Research (SABR), whose upcoming annual convention will feature Scott Boras as the keynote speaker. A non-profit organization with 6,700 members, SABR is a perfect fit for anyone who has an interest in baseball research, statistics and history. Vince's website is www.vincegennaro.com. Super-agent Scott Boras has built a reputation for securing top-dollar deals for his clients. Headlining his list of accomplishments are two separate deals for Alex Rodriguez that will earn the Yankee third baseman nearly a half-billion dollars over a 17-year period. Boras was also responsible for a matched set of seven-year, $126 million deals for Barry Zito and Jayson Werth. Beyond Rodriguez, Zito, and Werth, the A-list stars who count themselves as Boras' clients include Matt Holliday, Carlos Beltran, Mark Teixeira, Ivan Rodriguez, Adrian Beltre, Johnny Damon, Shin-Soo Choo, and Robinson Cano. Boras is also a master at skimming the cream of the amateur draft crop, landing both Stephen Strasburg and Bryce Harper as clients over the last two years. Does Boras simply have the best marketing machine, allowing him to lure star players into his camp, or does he truly get maximum value for his clients? To answer the question, let’s break down Boras’ stats. Over the last eight years (since the 2003-2004 offseason), he has a 6 percent "market share" of the 900-plus contracts signed in the free-agent market, but a staggering 21 percent share of the dollars committed to free agents over the same timeframe. 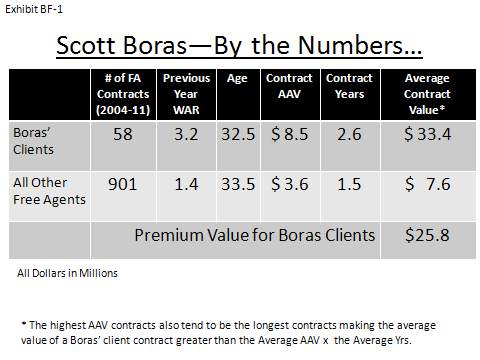 On average, the clients represented by Boras are top-of-the-line players, but not sufficiently superior to completely explain the premium he commands in both the average annual value and length of their contracts. Table BF-1 shows the quality (Wins Above Replacement), age, and contract values of Boras’ clients versus the rest of the free-agent market. On average, the super-agent’s clients had a WAR in their walk year that was 2.3 times that of the remaining free agents. However, the average Boras client contract has a total value of $33.4 million, while the remaining free agents average $7.6 million. That’s more than four times the contract value for 2.3 times the previous-year WAR. In much the same way that we go beyond the raw stats to evaluate a player's performance, we need to dig deeper to determine Scott Boras' "true talent" level. To help us better understand Boras' impact, I drew upon my statistical model of the behavior of the free-agent market. By analyzing the 900-plus free agent signings since November 2003, clear patterns and themes emerge—enough to draw some conclusions about which attributes and performance measures MLB teams explicitly or implicitly "value," and to quantify their impact on both a free agent’s average annual value (AAV) and the length of his contract. The model incorporates a player's expected performance (WAR), his age, a position factor (although WAR captures most of the difference in positional value), a proxy for a player's injury history, whether or not the player earned his stripes in the AL vs. the generally weaker NL, and even a marquee factor—a composite index consisting of internet and social media measures, fans’ All-Star Voting, and the market price of a player's rookie card—to gauge the player's overall popularity with fans. These factors, along with several others, do a solid job of capturing the behavior of the market, as they explain how much teams pay free agents. By adding a variable to specifically capture Boras' representation of a player, we can estimate a dollar amount (average annual value and contract length) attributable to him. 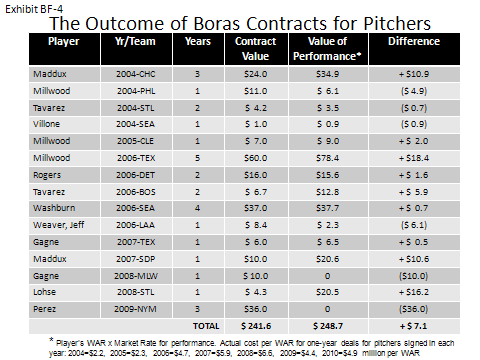 This analysis can also be used to estimate the portion of the $25.8 million premium in total contract value ($33.4 million for Boras less $7.6 million for non-Boras clients) that we can credit to the work of Boras and his firm. The most obvious factor driving a premium for Boras clients is their playing performance. On average, Boras advises free agents of above-average talent. Given the amount teams typically pay for expected performance, the higher caliber of Boras clients explains about 39% of the gap between the value of a Boras contract versus all other free-agent contracts signed over the last 8 years. Another source of the premium is his players' marquee status. My model indicates that players who are fan favorites tend to fare better in the free-agent market, even after adjusting for their past performance, age, and other drivers. I estimate that the marquee value of Boras' stable accounts for about 14 percent of the contract premium. Another factor we need to consider is the players’ age. On average, Boras clients hit the free-agent market at a younger age. Younger free agents command a slightly higher AAV, but gain an even bigger premium on contract length. The net result of the age differential is about 8 percent of the Boras premium. 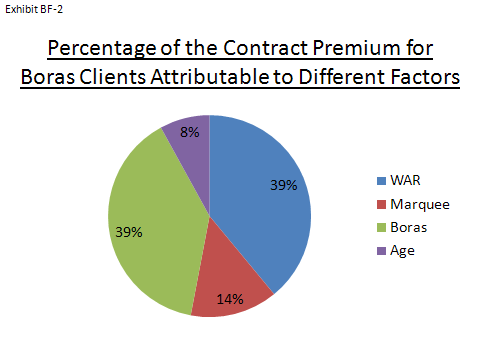 When you add all the non-Boras factors together, they account for about 61% of the premium paid to his clients in the free-agent market. That leaves a healthy 39% of the premium for Scott Boras to claim as his added value. (See BF-2). How does he command this premium in a marketplace where everyone knows his reputation? For one, he seems to gravitate towards situations where he has maximum leverage. When he brought Ivan Rodriguez into Detroit in 2004, Pudge was coming off a World Series win and the Tigers were coming off a 43-win season. He sold the Tigers on the need to bring credibility to a franchise via a marquee player who had established himself as one of the all-time greats at his position. Boras and the Tigers knew that Rodriguez would bring instant credibility to a team that desperately needed it. Boras also exploited the Yankees-Red Sox rivalry masterfully in the Mark Teixeira negotiations, knowing that part of each team's financial calculus was the fear that the Gold Glove first baseman would end up on the other team's roster. Another source of the super-agent's value is his ability to “package” his clients to prospective suitors and maximize the negotiating leverage they command, often invoking the name of all-time greats when presenting his players to teams. While most people would find it outrageous to use the words "Oliver Perez" and "Sandy Koufax" in the same week, Boras was not above using them in the same presentation during his pitch to sell Perez to the baseball world in 2009. Bold comparisons—even bizarre ones—can alter a team's frame of reference for the player, nudging him into a higher salary bracket. Boras is also known for the innovative structure of his deals. One notable example was J. D. Drew's pact with the Los Angeles Dodgers, signed prior to the 2005 season. The five-year, $55 million deal was structured to allow Drew to “opt out” after just two years. Taking advantage of this clause, Boras negotiated another five-year deal for Drew—this one for $70 million—with the Boston Red Sox prior to the 2007 season. Even Boras has a few swings and misses along the way. Kyle Lohse’s contract with the Cardinals, signed prior to the 2008 season—a modest $4.25 million, one-year deal—allegedly followed a significantly larger offer that Boras and Lohse had declined earlier in the offseason. Many question his handling of Johnny Damon after the 2009 season, when the outfielder ultimately landed an $8 million, one-year deal with the Detroit Tigers after seeking considerably more from the Yankees and perhaps overplaying his hand. Boras’ aggressive approach to maximizing his clients’ contracts can produce an occasional “casualty”—a player who fails to sign for his demands and remains on the market late into the offseason, when contract values often drop. Despite an occasional misplay, Boras seems to have a winning strategy for most negotiating scenarios. If the market is under-valuing his client, he often opts for a shorter deal. His one-year, $10 million ($9 million guaranteed) contract with the Red Sox for Adrian Beltre is a good example of a player who had fallen from grace and was not aggressively sought by teams. Instead of maintaining his demands for a high-dollar, long-term deal, Boras and Beltre accepted a one-year stint in a lineup and a ballpark destined to increase his value. His stock soared, enabling him to sign a five-year, $80 million deal this past winter with the Rangers. So far, we've focused on contract signings and their value relative to the market. We can also look at the outcome of the Boras contracts—how his players performed, and how much each team paid his players relative to the market rate for wins in a given year. As an example, let's look at Greg Maddux's 2007 one-year, $10 million deal with the Padres. In the 2006-2007 offseason, 37 pitchers signed one-year deals. Based on how they performed during the 2007 season, the average rate for one win above replacement was $5.9 million. Maddux delivered 3.5 WAR for his $10 million in salary. At $2.9 million per WAR, this was the free-agent equivalent of a "buy one WAR—get one free" deal for San Diego. Here’s another way to frame the results of the deal: Maddux provided San Diego with $20.7 million of value for $10 million in salary. Taking a broader look at Boras' pitcher contracts, 15 hurlers have fulfilled contracts that were signed over the last eight years. Teams received either fair value or a true bargain in 10 of the 15 deals. (See BF-4). Two Maddux deals, the Kyle Lohse contract with the Cardinals, and Kevin Millwood's five-year deal with the Rangers were among the most favorable for teams, when matched up against the going rate for pitching WAR in those years. The worst Boras pitcher pacts in recent years were Jeff Weaver's 2006 deal with the Angels, Eric Gagne's Milwaukee deal in 2008, and Oliver Perez's 2009 abomination of a contract with the Mets. (Technically, 2011 will be Oliver Perez's best year under his Mets contract, since his release ensures that he will deliver zero WAR, compared to his negative WAR in each of the previous two seasons.) When taken collectively, teams paid $242 million for the 15 Boras pitcher contracts in question and received $249 million in value. While in the aggregate they worked out, individually there were clear winners and losers. The case of Kevin Millwood is a good illustration of how the Boras dynamic can benefit all parties involved. As I mentioned above, Boras earned Millwood an extra $23 million on his five-year deal with the Texas Rangers in 2006—$2.8 million per year and one additional year over "market value." (Table BF-3). Millwood then proceeded to over-deliver on the increased commitment by providing Texas with $78.4 million in value (compared to the $60 million in salary) over the life of the deal. The team, the player, and the agent all "won" and shared in the financial rewards. Our story would not be complete without a live look-in on the Barry Zito deal in progress. Zito is guaranteed $126 million over seven years. With four years already in the books, he has delivered 7.4 WAR for a mere $39 million in value to the Giants. With 57 percent of the contract complete, the lefty has "paid out" 31 percent of the contract's value to the reigning World Champions. Zito would need to return to his performance levels of 2001-2003 for the remaining three years of his contract with the Giants to give the organization fair value over the life of the deal—a highly unlikely development given Zito's age and recent track record. 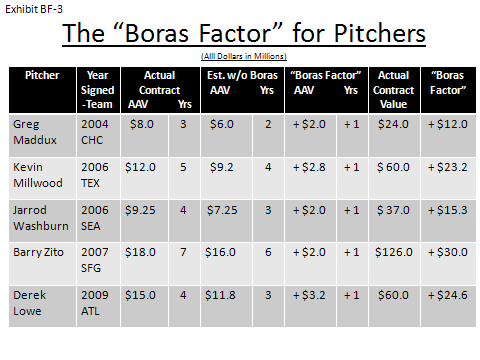 Our sample of pitcher contracts reveals that on average, Boras gets extra value for his clients, who often manage to justify that premium value with their performance. The problem is the wide variation around the mean on a case-by-case basis. The "average" result comes as little solace to teams who get the short end of their deals, like the Brewers and Mets in the cases of the Gagne and Perez contracts, which stand as stark reminders of the perils of the free-agent market. Whether you love him or hate him, Boras is a formidable representative of his clients’ financial interests, and he often succeeds in securing top dollar for his players. In the case of Scott Boras, the hype is justified. 21 comments have been left for this article. What would tthis look like without the "Tom Hicks factor" (Arod and Chan Ho Park)? Overall, nice work. Nice stuff Vince. It looks like one of the things Boras does is get an extra year that other agents couldn't. But the way you do it, you are giving the other agent 0$ for that extra year. I'm sure if the other agent asked for some low number, but greater than 0, then he'd get that. Take Zito. I agree that 16 x 6 is what the average agent would have gotten, and so 18 x 7 is impressive. But if the other agent wanted 7 years, he could have asked for an extra say 5.5MM$, and it would have happened. So, 14.5 x 7 is what he could have gotten. To make the comparisons fair, you need to hold constant the number of years. It seems to me that player value (in terms of $) relative to player value on the field is not linear. Rather, after a certain point, teams pay a premium for premium talent. So maybe $ to WAR is linear up until a point in which WAR is high enough to warrant (in most teams' minds) an even higher contract? That doesn't happen. A team will pay as much for a 1 WAR and 5 WAR player as it would for two 3 WAR players. Really? That is very surprising to me, because I had the same thought at ScottyB. Is there some research available on that subject? Really? It seems pretty clear to me that you would rather employ a 5 WAR player and a 1 WAR player than 2 3 WAR players - for one thing, when you realize that you are going to need an extra win to make the playoffs, it will be much easier to find a 2 WAR player to replace the 1 WAR player than a 4 WAR player to replace one of the 3 WAR players. You could also look at it as an opportunity cost - you are not just paying a player $10M a year - you are paying him $10M a year AND a roster spot. There's no roster spot issue. I said that given a choice between a pair of players, that a team will may each pair the same, if the sum of those is the same WAR. So +5 +1 = +3 +3 in terms of wins and salary. Again, I don't have the numbers, so I defer. That's about right. Say X = 5MM$, then ace pitcher gets 4 or 5X. The WAR for your 4 pitchers is 1, 2, 3, 5. There's nothing inconsistent with that you just said and what I just said, if you just dial back your "5 or 6" to "4 or 5". Yep. You posit a linear relationship carried through the entire range, while I posited a linear relationship that slopes upward at the higher end. You have data to support your hypothesis, and I just have an educated guess, so you're probably right. Do you see Tango's point as valid? If so, what will that do regarding 'Boras Outcomes'? I don't see Zito in that 'Boras Outcomes' table. Put it in there, and that +7.1 goes minusing downward bigtime. Any other 'in process' contracts in addition to Zito? OK, 3 questions. Lohse's 2008 season (200 IPs with ERA+ of 113) was worth $20.5 million?? Really??? Tango's point is definitely valid. One option may be to count 6 x $16 as the equivalent of 7 x $14.4, using the rule of thumb that I've seen Tango use in the past, where each additional year is worth a 10% decline in AAV. Then Boras 7 x $18 is $11.2 million more than the average agent (7 x $1.6 more per yr). The pitching contracts "in progress" besides Zito are Derek Lowe, Rafael Soriano, Mike Gonzalez and Bruce Chen. On Lohse's 2008 "valuation", when you rack up all the pitchers that signed one-year deals for that season, and look at how they actually performed in 2008, it cost teams $6.6 million per WAR, on average. So given the peer group that Lohse was part of for that one season. To buy his 3.1 WAR from that pool of free agents, a team would have paid $20.5 mil, on average. Check the BP archives for "Ahead in the Count, Revising Player Contract Valuation, Part 2" from 1/20/10. It explores the relationship between WARP & salaries and presents some economic theory on why the relationship between WARP and salary is linear and not exponential. Thanks, professor; an intriguing piece. There's a missing element to this calculation, though. Boras seems to represent a self-selected sample of players who want to maximize income and nothing else. My sense is that guys who weigh other factors -- like geography, club loyalty and pennant prospects -- don't join the Boras stable. Consequently, there's a certain apples and oranges comparison, don't you think? Not sure. It would depend, in part, on the % of the free agents that allows geography, club loyalty, pennant prospects to trump dollars. You seem to imply that the Boras-type client is the minority. I'd like to find a way to test for that--player motivation--because it's not obvious to me that his clients are outside the norm. In other words, if 100% of Boras clients are income maximizers and 90% of non-Boras clients are income maximizers, then this is not a big issue. I would agree with your first premise--if you are not an income maximizer, you probably don't want/need Boras, like when Kenny Rogers broke ranks to stay with the Tigers. What Waldo says. Now that he's said it. Given that it's established that free agents that sign with new teams don't do as well as those who stay, I'm curious as to how Boras' leavers compare to leavers in general. Oh, and thanks for the other "in progress" guys. sorry - I hit some combination of keys that posted a partial response. Anyway, the value only being 2.85% over the premium paid seems like an opportunity to convince a club that services rendered by a competing agent for a competing FA could be had at a contract discount to the team while providing equivalent WAR. It would be very interesting to see this same study performed for other "super agents" to provide a comparison. Let's look at your point in two parts: Paying a player "above market compensation" refers to the going rate of his expected performance. The player still has the opp'y to make good on this premium by outperforming expectations. As I said in the example of Millwood (Rangers). The Rangers overpaid, based on reasonable expectations about his performance, but then he over-delivered, even when measured against the premium. So, I wouldn't leap to "if he is paid more than the market rate (at the time of the contract signing), it's bad for the team"
I'm inclined to disagree slightly on that point. Yes, the Rangers wound up with surplus value from Millwood, but that surplus value would have been even greater if he were paid market value at the time of signing. It's still a good signing, but they paid more than they should have. On the other hand, if paying above market value caused Millwood to pick Texas over some other team, then it was clearly a good choice.